The use of Facebook auto comment is a really special feature in MaherPost Facebook Auto Poster. By using Facebook auto comment feature, you can get your marketing to the next level. With this feature, you can bump your Facebook group posts. 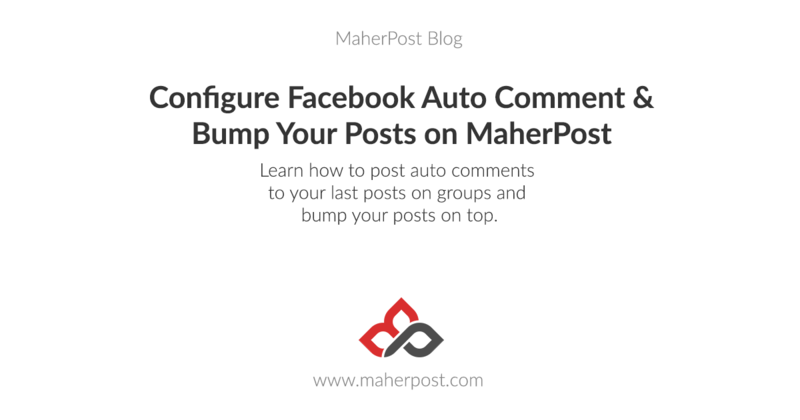 What is Facebook auto comment: Facebook auto comment is a feature on MaherPost, By using that, you can post comments to your already published posts. As you might already know, Posting comments to posts on groups will move them ahead of the page. Auto comment only works on already published posts on scheduled posts. You can’t use it with Post now. MaherPost’s Facebook auto comment feature posts comment to your previous posts only. So it’ll send comments to your already published posts and that will make them bump to the top of the page. To create your comments, Click New comment button and write your comments. It is recommended that you create 5-10 or more comments here. So you can later choose to post them randomly on each group post. So it looks authentic. Note: Make sure to write comments that make sense, if you write spammy comments, they might get reported often. Schedule your comments to groups: To schedule your comments, Go to Publishing > Scheduled posts page. Here, you’ll find the list of all your scheduled posts. Here, choose which schedule you wish to start the auto commenting on. First, choose the accounts you wish to post from. (If you select multiple accounts, comments will post from random accounts – this is recommended). Third, choose the time delay you wish to use between each comment, we recommend 30-60 minutes. 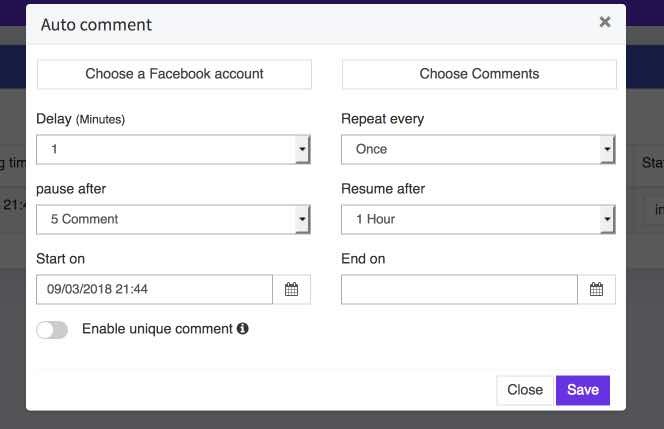 And lastly, choose the start and end time for comment posting. Leave pause after and resume after to default or change them if you wish to. You can also enable unique comment, that’ll add a random id to your comments to make them unique. See the auto comment log: Your comment schedule is now running. To see the status of your schedule or pause it, Go back to the scheduled post page. 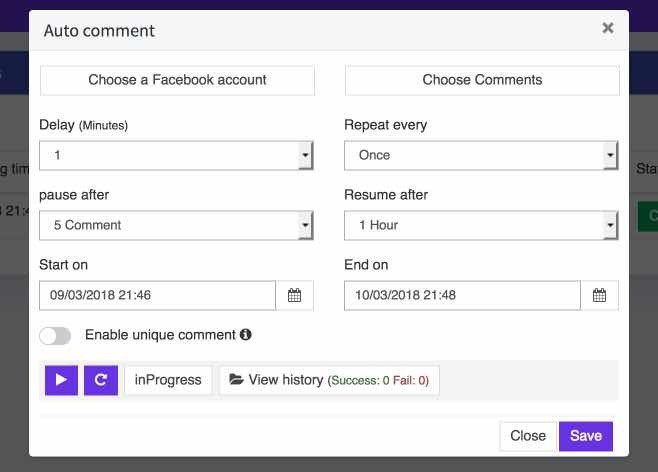 Here, you can see the status of your comment schedule and you can even pause or restart paused comment schedule. Just Curious: Could Auto comment BUMP posts made to my timeline or newsfeed back up to the top of everyone’s newsfeeds? Yes, you can auto comment on your own posts too and bump it on your friends’ newsfeeds, but newsfeed algorithms don’t work same as groups, so it might not get bumped on all friends’ newsfeeds necessarily.